Background: Phytoestrogens have recently been claimed to positively influence menopausal discomforts, including hot flashes. However, little is known about the influence of phytoestrogens on core body temperature during oestrogen fluctuation at menopause. Objective: Previously published findings showed that phytoestrogens could relieve menopausal complaints, thus, the present review was aimed at assessing the effects of phytoestrogens on thermoregulatory mechanism during menopausal transition. Results: The molecular mechanisms underlying hot flashes are complex. Oestrogen fluctuations cause hypothalamic thermoregulatory centre dysfunction, which leads to hot flashes during menopause. The phytoestrogens of interest, in relation to human health, include isoflavones, lignans, coumestans, and stilbenes, which are widely distributed in nature. The phytoestrogens are capable of reducing hot flashes via their oestrogen-like hormone actions. The potential effects of phytoestrogens on hot flashes and their molecular mechanisms of action on thermoregulatory centre are discussed in this review. 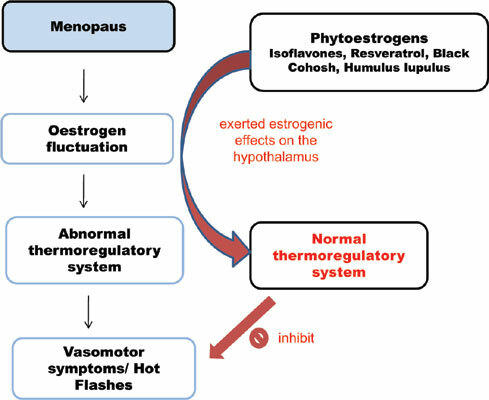 Conclusion: The effects of phytoestrogens on these mechanisms may help explain their beneficial effects in alleviating hot flashes and other menopausal discomforts. Phytoestrogen, vasomotor symptoms, hot flashes, thermoregulatory mechanism, molecular, perimenopause.